Couldn’t find an up to date blinksec-table so I made a new one. 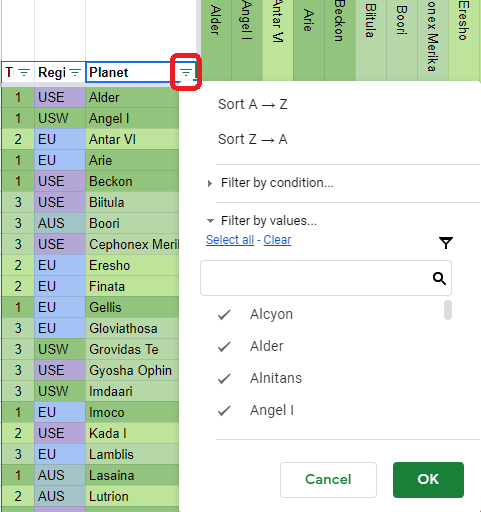 Also included are tabs for portal conduit counts and oort/h prices between planets. Please add a comment if you see something wrong. This is the button you’re looking for if you haven’t used filters before. Way easier to read then the static images. Very Nice! Thank you kindly!! Never realized how uneven the T1 planets were, some can connect to 4 other planets with a 2 block portal, while others can only connect to 1, or in Lasaina’s case 0, ouch. Yeah this is more for when you need to actually manipulate the data. Images are hard to modify to your own needs. Is the conduit requirement for both? so if I do a 2x2 on one planet and a 2x2 on another that’s 8? Or is the requirement only for one side?